This device was designed to launch a rocket with a shaped charge warhead from a shoulder-held launcher, introduced in 1961. The poster shows the current versions, widely used by Russian and Former Soviet bloc country troops. 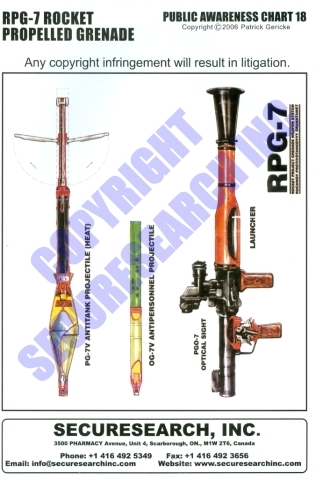 The launcher tube and rockets have been exported all over the world and are seen daily in television images in use by terrorist and insurgent groups, fired against armored vehicles and building walls. The high explosive shaped charge warhead at the front of the rocket is capable of penetrating medium tank armor. In the model PG7VL grenade, the warhead is capable of penetrating 32cm (320mm) of armor. Several different warheads have been developed, as well as more advanced versions of the current launcher. This device was designed to launch a rocket with a shaped charge warhead from a shoulder-held launcher, introduced in 1961. The poster shows the current versions, widely used by Russian and Former Soviet bloc country troops.